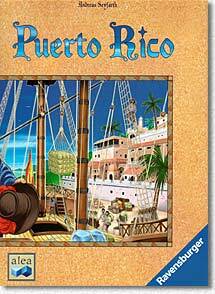 Andrea was really eager to play "Puerto Rico" again, which was absent from our gaming table for quite a while. 4 players being the ideal number we readily agreed. Of course we were also longing for being able to cruelly flog slaves into submission, being the evil Germans that we are. And of course this is only a joke ;-). The game began with Walter taking the settler to get a quarry. As there were 3 coffees laid out, and I was a maize player, the coffee/maize tactic basically jumped at me, as coffee would be rare in the future. Andrea imitated me. The game went ideally for me in the first 6 rounds or so. First I was able to make quite a good profit with the neglected gold digger and the small market, so I could quickly buy the coffee mill. For a couple of rounds I was the only person to sell coffee, so I upgraded to the big market. Thomas went for the diversity tactic and the manufacture, Walter went for the quarry/building tactic, Andrea pretty much imitated what I did. Because I was clearly leading the game, the last rounds were not so profitable for me (the others got more careful with their choices), and I made some wrong decisions about acquiring large buildings (because of my guaranteed money flow I actually bought 3 of them in the end), so Andrea caught up pretty well. But in the end she didn't manage to beat my quite high score of 63 and made second place. Thomas and Walter (3rd and 4th place) were nearly tied, but didn't fare so well. Again the game went never exactly as planned for anybody, and always remained interesting. And, we treated our slaves like kings, and gave them their freedom at the end of the day!